For more than three decades, artist and tile maker Michelle Griffoul has pushed at the boundaries of her chosen medium. Her wildly colorful and boldly expressive works bristle with a passion for nature and a love of whimsy, resulting in a body of work unique in the realms of interior, exterior and watershape design. In this feature, she defines her distinctive approach to a classic material and takes us on a pictorial tour of her colorful works of art. I’ve been playing with clay for a long time – ever since 1968, when I took my first ceramics class in high school. Clay has captured my imagination mainly with its flexibility: I can carve it, build with it and even color it. For years, I’ve sculpted pieces of tile out of stoneware and porcelain clay. The individual pieces are then combined to create mosaic compositions, which, among other things, means that I’m able to create works of art that can go just about anywhere and are especially at home in and around water. Now, more than 30 years into working with this wonderful medium as a potter, then as an art student in the United States and Italy and especially in my subsequent career as a tile artist and manufacturer, I still find myself caught up in an endless stream of ideas and possibilities. And the stream really is limitless: In fact, whenever I look at the work I’ve done or see the works of others in the field, I’m always thinking of ways these expressions could become even more engaging, more exciting, more surprising and, specifically, more colorful. When I was starting out, it always seemed to me that even fairly elaborate uses of tile I observed did not come anywhere close to exercising the medium’s potential, so I took a different path and began treating the tile I was making as sculptural building blocks rather than as commodities to be taken off a shelf. This led quickly to compositions that were far more elaborate than almost anything I’d ever seen, to the point where the output of our studio in Buellton, Calif., is now the visual key to a wide range of pools, spas and fountains as well as a variety of interior and exterior architectural applications. Today, we make hundreds of different tile pieces that are little works of art and become parts of much larger compositions. It all starts with the clay, which we buy 12 to 15 tons at a time. From that raw material, we hand-craft every single piece of tile we use in our work and color each with glazes we’ve developed. As an artist, I often cast my work with a strong sense of visual flow, with tile forms literally sweeping or winding across walls or floors to suggest streambeds or tidal estuaries or other suitable ‘habitats’ for the marine life that’s so much a part of my work. It’s our sense that our tiles and compositions look so different from mainstream products because everything we do in the studio flows from the point of view of the artist. We treat each piece of tile as its own work of art and each project as its own entity, so everything we do immediately takes on a character of its own and plays an active role in its environment. We tailor our work to the space, so not all of our pieces are necessarily large – perhaps just a small medallion on a deck or a trim detail on a set of steps. But our work can also encompass an entire swimming pool and flow into surrounding structures, depending on the setting and the client. Large or small, we always try to use the tile to make bold statements. Even a dozen ceramic leaves “blowing” across a slate floor or a patio can make a huge difference in the warmth and character of a space, as can a small school of fish at the bottom of a pool that seem to dart through the water when a breeze ruffles the surface. Small or large, our artistic mission is wonderfully clear: We aim to bring fun to people’s lives, and many of the areas in which our works are installed have that same lighthearted purpose. By adding color and texture and line, we seek to bring these areas vividly to life and make the experience of being there somehow more rewarding. It’s a characteristic of our work that we play with shapes that go well beyond squares and rectangles. Indeed, I’ve always thought that curves are the most beautiful lines in nature and that working with them in clay opened the door to an entirely new set of possibilities with tile and mosaics. So when I first started making tile, I never made anything that was rectilinear or even close to it. Everything was some sort of organic form or had an irregular, curved shape, and I’d been at it a full ten years before I made my first four-by-four tile. I just wanted everything to be more interesting, so instead of cutting squares I focused on fish and leaves and lizards and frogs. We frequently make strong visual statements with our tile, either with vibrant colors or imagery that lends warmth and character to a space. The results can be surprising and a playful source of visual delight. At first, everything we did was one of a kind, which satisfied our artistic impulses. But as more and more people saw our work, increasing numbers wanted us to replicate work we’d done before – or come close, anyway. That’s how we started in the tile-manufacturing business: To reproduce what we’d done, we began keeping records on the tiles we’d made and in the years since have compiled a whole line of tiles and patterns derived from original works. These tiles are available in showrooms across the country, but our focus is still on original work and in customizing commercial patterns to specific projects. We work directly with designers and their clients and take great pleasure in getting involved in conversations that inspire clients to explore a broad range of colorful possibilities. 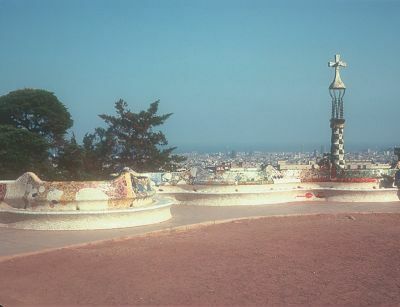 I’ve always been flattered by the fact that the work we do is often compared to the wildly colorful works of architect and sculptor Antonio Gaudi of Barcelona. I actually started working in mosaics long before I was aware of Gaudi’s amazing tile-festooned sculptures, but I understand the comparison. But there’s a big difference between our work and that of the Spanish master in that the tiles he used were remnants obtained from local manufacturers in an unusually enlightened process of recycling. By contrast, we make all of our own tile, so the approach is significantly different and much more controlled. The results, however, can be quite similar in expression, in the vividness of the colors and in the visual complexity – not to mention the spirit of fun. As I’ve become more familiar with Gaudi’s work, I’ve been especially inspired by his use of curved forms: Everything he did was sensuous and alive with swaying natural forms, and it has definitely influenced the work we do. For me, color is the key. I love blending colors and coming up with new glazes and color combinations, and I credit my mother for that passion. When I was a child, she’d say things like, “You can’t ever wear two colors of red at the same time because they don’t match.” She was quite conservative when it came to colors, and she passed along all these “rules” she’d been taught years before in a convent school, where I guess the appreciation of vivid colors was never high on the list of priorities. Like many children, when I began working with clay and creating my own works of art, I rebelled against my mother’s precepts and started using all sorts of wild color combinations – and they worked. During the early stages of my career I also became involved in weaving in a big way and started experimenting with different-colored yarns and dyes. I was so caught up in it that I would order yarn from specific breeds of sheep so that I could achieve the exact textures and colors I wanted. Working with wool, I learned that you could blend lots of different colors in a single weave to create something completely new and different. That experience influenced the way I look at mosaics as a process of weaving together a palette of colors in single pieces and throughout a composition. It also made me passionate about glazes and led me to dive headlong into their chemistry and manufacturing. To this point, I’ve formulated and tested no fewer than 5,000 different, original glazes. This work is ongoing, and we keep extremely detailed records of every glaze mix that we’ve tested along with the results. Today, we choose from about 100 different glazes, each the result of its own painstaking process of trial and error. We develop our own glazes, so many of the colors we use are unique to our work. The palette is incredibly flexible and includes everything from the subtle earth tones seen here to the big, bold colors of marine life. Each tile blank is glazed by hand with paintbrushes. Some of the fish, frogs, lizards and more elaborate pieces require application of eight or nine colors applied using various classic techniques, including use of layers of wax to maintain color separation. We work with so many glazes because I like creating color palettes that have a lot of depth to them and have found that combinations of contrasting colors with subtle transitions will get the job done. We use a variety of sheens – some that reflect light, others that absorb it – and blend all of the visual elements to lend detail and interest to the work. Throughout my life, I’ve always loved swimming in the ocean and just about everything the seas have to offer. They feed, soothe and excite us and have inspired poets, artists and dreamers throughout the ages. When you go swimming in the ocean, there’s something intimate about being in the water that goes way beyond anything I could ever express in words. There’s a thrill and excitement, a joy tinged with a certain fear of the unknown that makes every visit a new adventure. I’m aware that, as a human being, I’m not really designed to go into the ocean, so whenever I do, I always feel like I’m visiting a world that is somehow alien, yet familiar. If I had to point to a single experience I’ve had that drives the spirit of my firm’s artwork, it’s been my time diving into the ocean and looking beneath the surface. In fact, if all we ever did were mosaics that capture marine life, there’d be enough variety to keep us going infinitely. The experience of swimming and diving in the ocean has been so crucial to my own work that I more or less think it should be a mandatory activity for anyone who creates art, no matter the medium. But if ocean swimming is not your thing, then hiking in the forest isn’t a poor substitute! As wildly creative as all of this might seem, it’s also very precise work. When experimenting with glazes or combinations of materials, for example, factors such as firing times and kiln temperatures are critical, with differences of ten minutes or ten degrees making noticeable differences in color. Because we need to reproduce our work accurately, we maintain precise records of the chemical formulations, application processes and exactly what happens inside each of our 16 kilns. That’s an awesome amount of detail on both the design and production sides, but the result is still all about fun and coaxing a beauty that rewards closer inspection out of simple materials. Those who see the work will immediately perceive it as fun and colorful. What we hope is that we can engage those people on a deeper level and treat their eyes to tremendous detail and variation in a work that may be composed of hundreds or even thousands of individual, hand-made pieces. Each piece has its own story to tell, in other words, and the detail is there to interest whoever decides to look more closely. All the detail and creative flair in the world doesn’t mean much, of course, if the images at hand don’t resonate with the viewer and inspire them. That’s why, like many artists, I turn to nature for inspiration and direction in our designs – plants, fish, amphibians, birds and land animals. Some come from my own experience, but other times subjects are suggested by clients who have a specific attachment to a fish from local waters, say, or a distinctively local plant. We don’t feel compelled to use square tiles or pieces of any consistent size or shape, so the tile work has a rich texture, both visual and tactile. Again, there’s a flexibility to the medium that lends it visual power. At the same time, we also do patterns that are purely abstract and geometrical. Some of these are intuitively created, but my suspicion is that my years of working with textiles have placed images and experiences in my brain that find their ways into my tile work. We also use a variety of found objects as images – everything from surfboards to Martini glasses or coffee mugs. On occasion, we’ve even created mosaics based on photographs of people. Of all the projects types we tackle, swimming pools are probably the most fun. 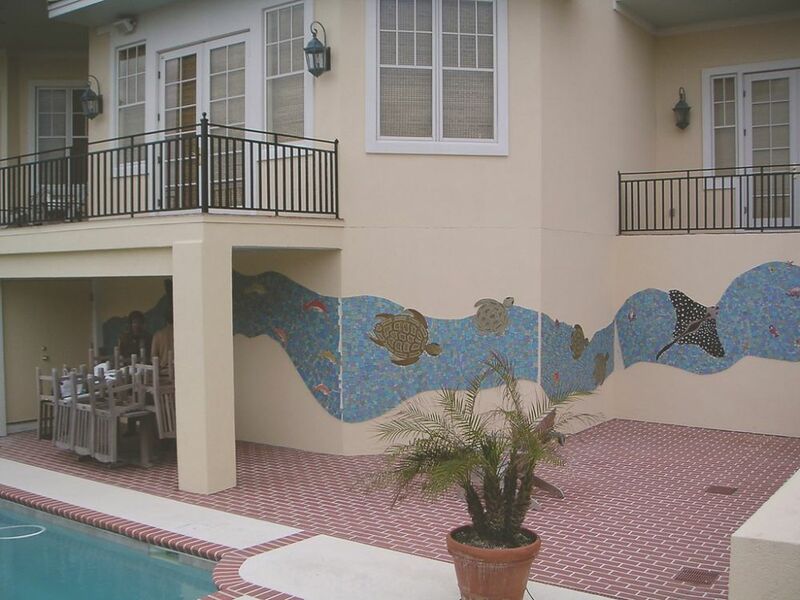 From waterline tile and mosaics in the bottoms of pools to steps, decks, coping and walls, pool environments offer all sorts of wonderful opportunities. There’s the obvious advantage that pools are made for fun and enjoyment, a perfect fit for the style and spirit of much of our work. Tile and water are truly made for one another, with the rippling liquid surfaces mirroring the fluidity of our own work with fantastically compatible colors and textures. 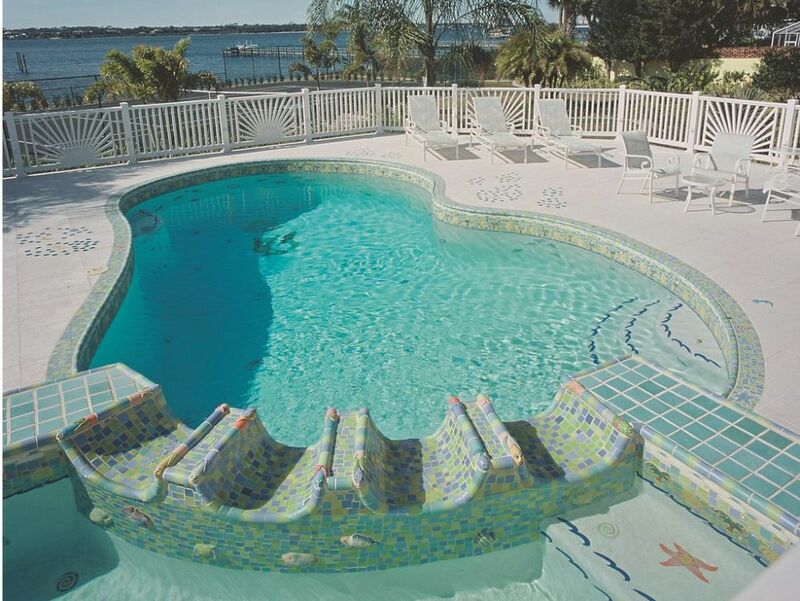 This is why decoration of pools is perhaps our favorite project type. We find that it’s fairly easy to get clients excited by the thought of doing more with their pools, basically because conventional use of tile in pools has been, well, both limited and rather boring. 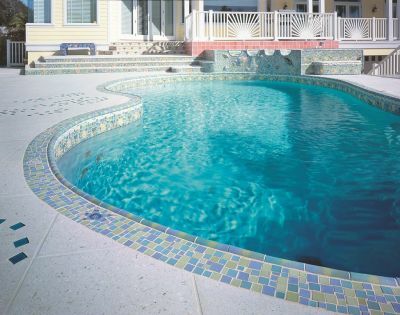 Instead of relegating tile to a waterline band, we aim to integrate the pool with its surroundings, whether it’s using small mosaics on the deck to give the impression that water has splashed out of the pool and that there’s now a frog sitting in the puddle, or something as simple as picking up colors or patterns seen in the pool at various locations within the whole backyard setting. To that end, we urge designers and clients to consider tile and mosaics as an integral part of the design process right from the start. Yes, we can work with an existing design or space, but what we can offer in those cases is limited by the fact that surrounding materials and details have already been chosen. By contrast, if tile is considered at the start, there are so many more exciting ways the material can be used to integrate visuals and tie the inside of the home with the great things going on outdoors. Certainly, we can dovetail our work to someone else’s vision, but when that vision includes vivid and exciting materials from the outset, the results are almost always among the most satisfying work we do. 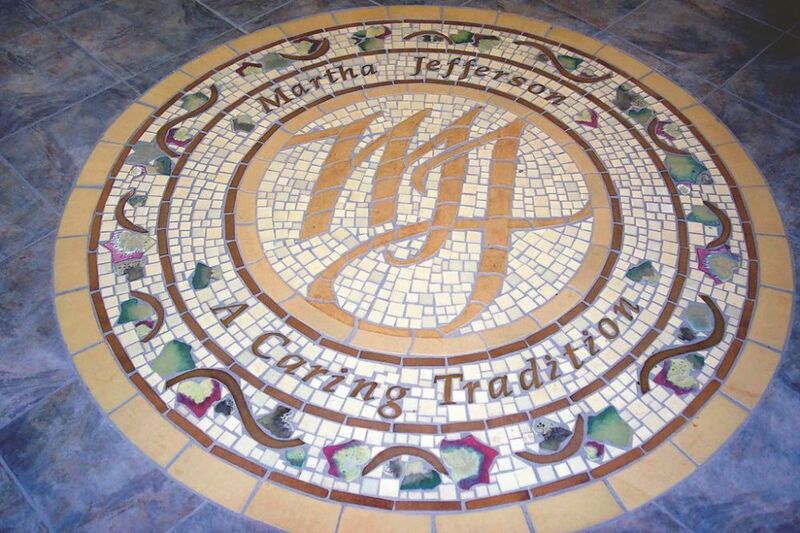 Michelle Griffoul is founder and principal at Michelle Griffoul Studios in Buellton, Calif., a designer and manufacturer of highly customized tile and tile mosaics. For more than 30 years, she has thrown, pushed, rolled, torn, painted, flocked, fired, baked and in many ways stretched the acknowledged limits of clay as a material. A classically trained potter, Griffoul combines the eye of a painter with the production skills and sensibilities of a manufacturing engineer. While studying for her BA and MFA degrees, she spent a year at the International School of Ceramics in Florence, Italy. She has also staged numerous gallery shows and complete several public art commissions.